We are often asked why Jugetsudo’s sencha has the word “asa” on its packaging. “Asa” means morning in Japanese, and it is believed in Japan that a cup of green tea in the morning brings you good fortune. There is even a saying that goes, “Go back home to have morning tea despite the seventeen miles”—meaning that you should go home and have tea, no matter how far from your home if you realize that you have skipped your morning tea. Does a cup of green tea in the morning have some mysterious power, or is it just superstition? There seems to be some reasons. First, green tea is good for your health. Green tea contains theanine that works as an anti-oxidant. 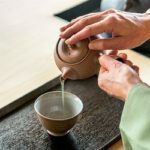 In Japan, it is a well-known fact that there are the least cancer patients in tea-producing areas like Kakegawa and Fujieda in Shizuoka prefecture. People living in these regions drink green tea daily. 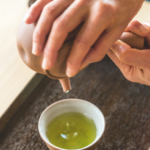 In the olden days, people in Japan did not know the science behind this, but they somehow must have known that green tea is good for your health. Second, the hot tea wakes up your body and helps prepare yourself for the day. 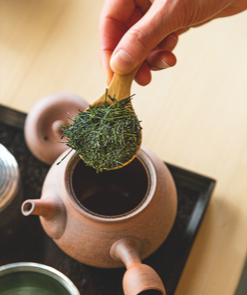 It is not only the tea, but it is also the process of boiling water, putting the tea leaves in the pot, pouring the hot water in the pot and so on. The caffeine in the tea also helps reduce fatigue. Have some Jugetsudo sencha tea in the morning before you leave your home! start your day with a cup of green tea!